On that last Friday cooking, I invited my Taiwanese friend to my Peruvian friend's place and I assigned him to work on the main dish. At the last minute, he called at my lab that he can't make it...So, I have to figure out a last minute dish. 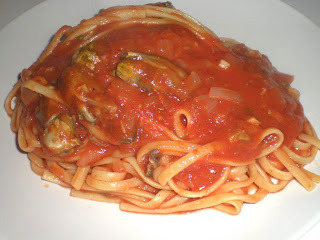 I was quickly browsing in the supermarket to see whatever is on special and finally, I came out with clams in tomato sauce reduced in white wine served with linguine. For a last minute dish, it was quick and delicious especially with white wine. 1. Heat oil in large saucepan over medium heat. Cook onions until transparent, about 5 mins. 2. Add garlic and cook for 1 min until fragrant. 3. Add tomato sauce and ketchup, clam juice and white wine. Bring to boil. 4. Reduce heat to low and cook for 15 mins, partially cover. Stir occasionally. 5. 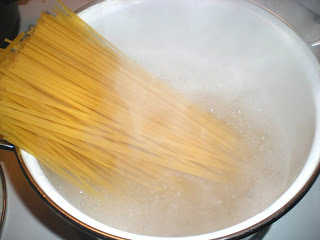 Meanwhile, cook pasta according to package instructions, until al dente. 6. 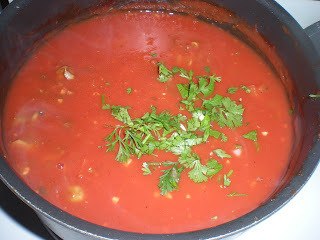 Add parsley and clams to tomato sauce and cook for 2-3 mins. Season with salt and pepper. Delicious, simple dish. Well done whipping it up at the last minute. I have clams I need to use. This looks awesome. Thanks for such a quick and flavorful recipe.